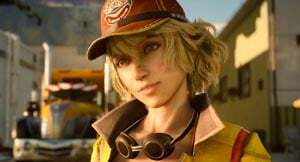 Cindy Aurum is a Character in Final Fantasy XV. Belle of the body shop who handles the day to day business while her cranky grandfather tinkers away in the garage. Cindy is an accomplished mechanic herself, and assists Noct and the gang’s trusty car, the Regalia. Speak to Cindy to open up the options for customizing the Regalia. Once made available you can acquire these through mechanics. Body: this option changes the color the car's body. Black is the default color, with others available including pre-order skins. Interior: this changes the color of the interior of the car. Black and white is the default color scheme, with others available such as: Light beige, Walnut Brown, Camel Brown, Dark Rose, Gilded Lilac, Dark Charcoal, Raven Black and more. Wheel: this option allows you to change the color of the wheels. Metallic Silver is the default color. Other available colors are: Metallic Gold, Nightstar Silver, Matte Whitestar, Matte Blackstar and more. Decals: this allows you to apply decals to the exterior of the car. They can be placed on several areas of the car. Component: this allows the installation of components to improve the performance of the car. Eventually you will use this option to transform the car into the Regalia Type-F which flies.